I have obtained 3 species of this new and rare plant that has many species and with more new ones being discovered. These plants can be grown in low to high light. All Bucephalandra are plants growing only on the island of Borneo. They are grown on river sides in swift waters. Bucephalandra look very similar to Anubias in appearance. The Rhizomes attach firmly onto rocks and wood. The stems of the Bucephalandra are mostly pink or red, and during stress, the Bucephalandra can lose its leaves. 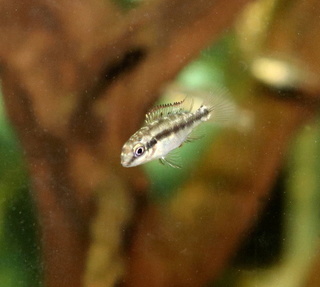 Bucephalandra have only recently been in cultivation in aquarium conditions. 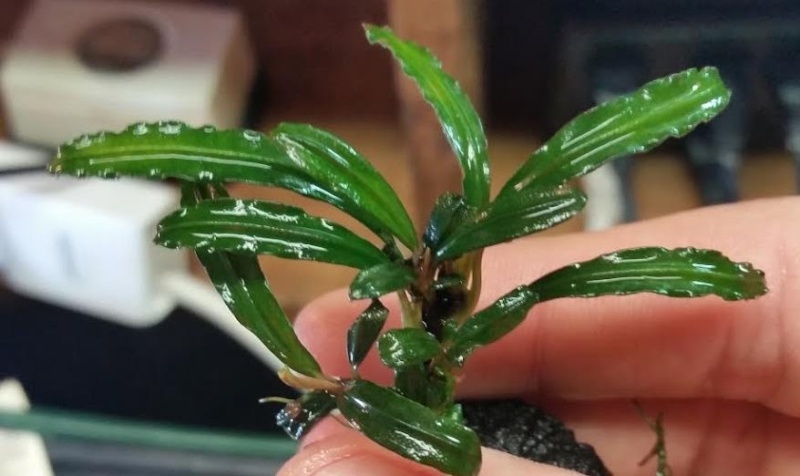 The price of Bucephalandra are very expensive, but over time will become more affordable. Bucephalandra leaves are very colourful. Depending on the species, you would be able to see the colours of the rainbow. 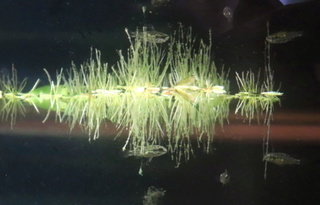 Majority of the species have reddish to pink stems, with shiny green leaves. Also depending on the angel you view the leaves, you will also see bright shades of blue, light green, copper, and reddish. 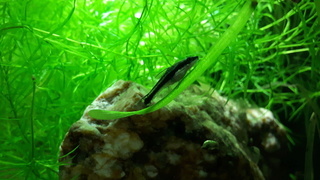 Bucephalandra are mainly small to medium size plants. Bucephalandra are not difficult plants, providing them with good conditions like strong lighting, a lot of co2 and good fertilizer. 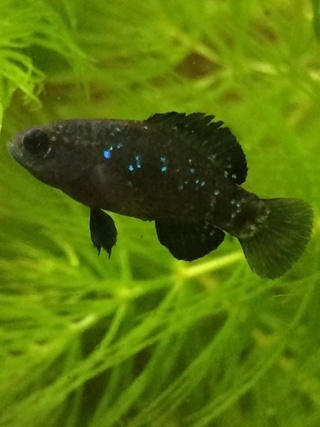 If these conditions are met, we can enjoy their fast growth rates and their beautiful colors. 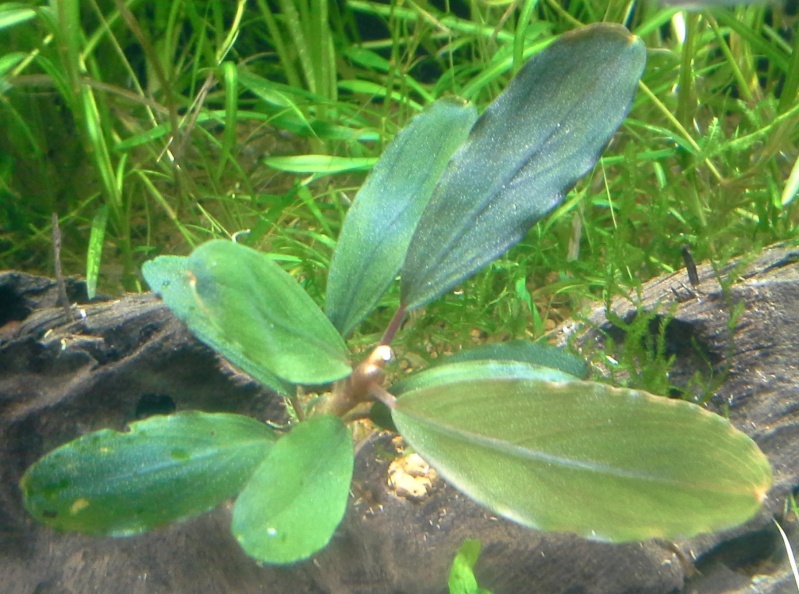 When plants are converted to low tech aquariums, newly grown leaves would not be as colorful compared to high tech tanks. 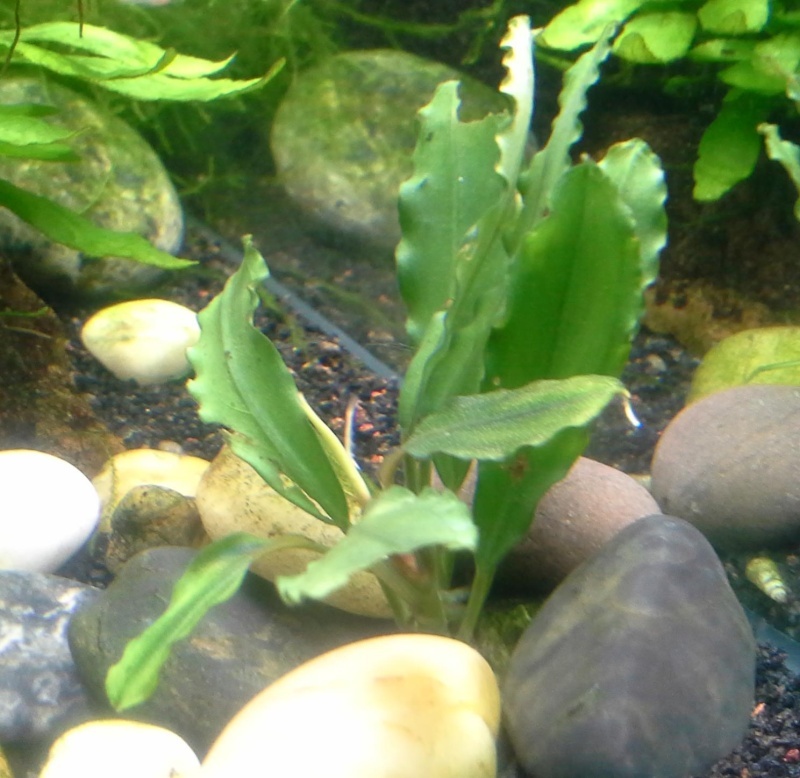 Bucephalandra propagation is very similar to the Anubias, when a new growth is formed on the main Rhizome, make sure there are a couple of roots before you can cut and remove. The newly cut growths can be tied only rocks and wood with black cotton until they have take hold of the material. The 3 species I have obtained are Brownie Red, Sekadu, and Icarus Bell. And there shown in that order listed in the pictures below. Your quite welcome. Not to often I get the chance to write about a plant many have not yet heard of. I am very eager and interested to see how they grow and turn out. I just received the plants yesterday and still learning about them myself. From Borneo ! Just reading some info on the net. Very intrigueing. Thanks guppyguy, for moving the knowledge forward ! I have heard about "Buce" before. Some of the photos I have seem of them are beautiful. 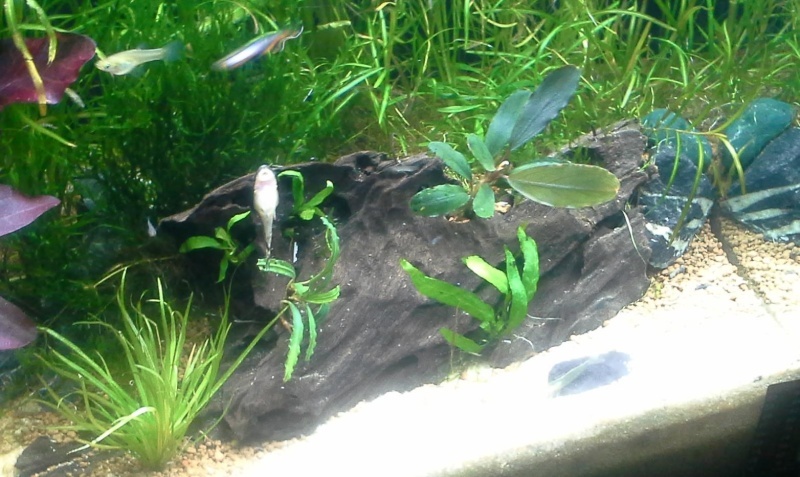 I really like the fact that they attach like anubias because I like to do bare bottom tanks. The only real drawback is that they are rare and expensive. Wow. This plant is very beautiful! I really wish I am able to find some sooner than later! Defenitely a plant I would love to purchase. @l_l_l wrote: Wow. This plant is very beautiful! A very nice plants but not cheap. But a wonderful addition. I cant wait till they grow out. I checked them out already but the price still isn't right enough for me to take the jump. Maybe in a year? @l_l_l wrote: I checked them out already but the price still isn't right enough for me to take the jump. Maybe in a year? Exciting to see that theplantguy is going to get these in. @CAAIndie wrote: Exciting to see that theplantguy is going to get these in. I am certainly happy to see these coming to the theplantguy site. I saw several of these species for sale in the Bangkok market. They didn't seem really rare there, but then, they are so much closer to the source! @Biulu wrote: I saw several of these species for sale in the Bangkok market. They didn't seem really rare there, but then, they are so much closer to the source! Well they all come from Borneo. So I can see them being much more common there for sure. Wish you could have brought some home. I will be doing a big order in a month or so....Hope to bring in lots of variety this time...john..
@The PlantGuy wrote: I will be doing a big order in a month or so....Hope to bring in lots of variety this time...john..
That is great news John. Looking forward to it. How are these doing Guppyguy? Any specific ones seem to do better than others? Thinking about picking some up. @CAAIndie wrote: How are these doing Guppyguy? Any specific ones seem to do better than others? Thinking about picking some up. Well they are slowest growing plants I have ever had. They make anubias look fast. But they are beautiful and unique. Out of these 3 I mentioned I only have the Icarus bell now and it is doing well and I picked up another called brownie purple. While I had my brownie red plant, it had flowered for me 3 times and the brownie species seen to grow faster than the others I have experience with. There care is very simple you just need patience. Do you find they have similar algae issues like anubias? Only attached to objects, and not planted too correct? They need to be shaded by other larger plants to avoid similar algae issues that anubias can get. And yes only attached to rocks or driftwood. Once attached they have a incredibly good hold.